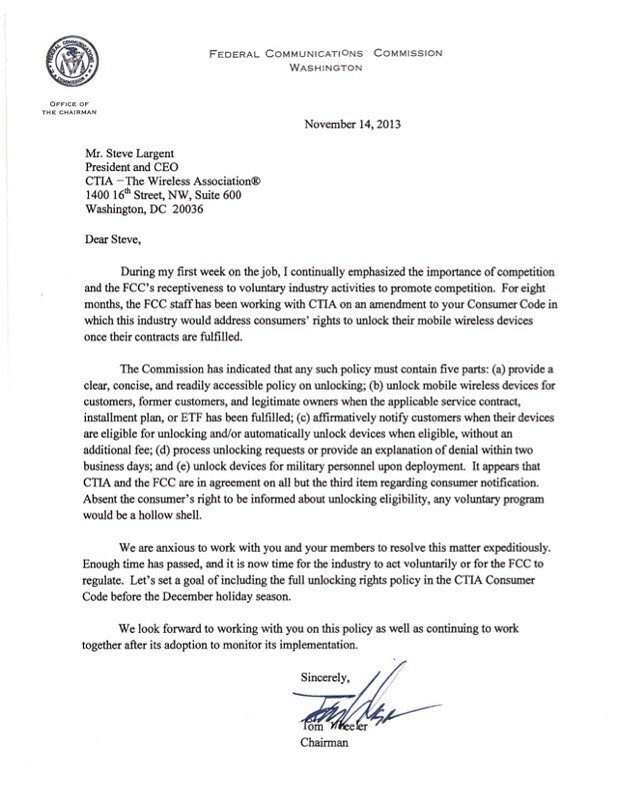 Tom Wheeler, the new FCC Chairman, has penned a letter to the CTIA (The Wireless Association) urging them to make cell phone unlocking legal before the holidays, or have the FCC step in to regulate. Wheeler says, "Enough time has passed, and it is now time for the industry to act voluntarily or for the FCC to regulate." He wants the CTIA Consumer Code to contain the full unlocking rights policy "before the December holiday season". The FCC is demanding that customers have the right to unlock their mobile devices once their contracts are fulfilled and that carriers notify them when their devices are eligible for unlocking. Of course, this is great news for U.S. consumers and we'll keep you up to date with any developments. The full letter is attached below. During my first week on the job, I continually emphasized the importance of competition and the FCC's receptiveness to voluntary industry activities to promote competition. For eight months, the FCC staff has been working with CTIA on an amendment to your Consumer Code in which this industry would address consumers' rights to unlock their mobile wireless devices once their contracts are fulfilled. The Commission has indicated that any such policy must contain five parts: (a) provide a clear, concise, and readily accessible policy on unlocking; (b) unlock mobile wireless devices for customers, former customers, and legitimate owners when the applicable service contract, installment plan, or ETF has been fulfilled; (c) affirmatively notify customers when their devices are eligible for unlocking and/or automatically unlock devices when eligible, without an additional fee; (d) process unlocking requests or provide an explanation of denial within two business days; and (e) unlock devices for military personnel upon deployment. It appears that CTIA and the FCC are in agreement on all but the third item regarding consumer notification. Absent the consumer's right to be informed about unlocking eligibility, any voluntary program would be a hollow shell. We are anxious to work with you and your members to resolve this matter expeditiously. Enough time has passed, and it is now time for the industry to act voluntarily or for the FCC to regulate. Let's set a goal of including the full unlocking rights policy in the CTIA Consumer Code before the December holiday season. together after its adoption to monitor its implementation.